Entries are coming in for the 28th running of the Chichester Corporate Challenge road races – and the organisers, Chichester Runners & AC, are anticipating another bumper entry in all age groups. The opening race night in a series of three takes place just after half-term – on Wednesday, February 27 – with the second on March 13 and the final races on March 27. From its first running in 1992, the event has caught the imagination of local runners for nearly three decades and now attracts athletes from along the south coast as well as the best in West Sussex. In the intervening years more than 40,000 finishers have completed the event. The tight city-centre circuit always presents a challenge for competitors as they set off at a furious pace, cheered on by crowds of spectators lining the route. The senior part of the evening will see the field split into two categories with the faster athletes in the A race, reserved for those who have around a sub 40-minute 10k time. A few at the front of the elite race will be aiming to get close to the 13-minute barrier for the 4,500m four-lap course with a number of Chichester’s homegrown talents again likely to feature. Whether anyone will challenge the course record of 12min 38sec set by American doctor Chris Zablocki in 2016 remains to be seen. The women’s record is one which has stood even longer with ex-international Zara Hyde-Peters having run 14.15 in 1996, a time not matched since. The B race is equally well contested with the next group of club runners being joined by less experienced athletes and a number of beginners, all of whom are out to record personal-best times as well as helping their corporate or sports teams fight for team medals. Last year’s overall winner, Ed Dodd, helped his Russell Giles Partnership team to the title for the first time in front of multiple winners DSTL from Portsdown and locally-based Irwin Mitchell Partnership. One of Chichester’s improving under-17s, Will Broom, won the final 2018 race outright and helped Chichester’s joint under-17 and under-20 team to an overall sports team title, impressively having aggregates of less than 60 minutes for their four runners in each of the three races. University of Chichester student Alice Wright led her team to the women’s sports title while WSCC picked up the women’s corporate award. The senior section accounts for roughly half of the 800-plus runners who pack the city centre for the event – the junior races have become increasingly popular over the years with a total of six separate races for the youngsters in 2019. The primary-school races for Years 5 & 6 are run over two laps of the junior course totaling 1,400m while the secondary-school races are over three or four laps of the 700m loop depending on age. It will be good to see a number of the ex-juniors battling with the seniors, including last year’s junior boys winner Liam Dunne and under-20 Ben Collins, who still holds a number of the junior boys’ records from his primary-school days. Entry forms can be downloaded from the Chichester Runners website – www.chichester-runners.org.uk – and for any queries, please contact race director Phil Baker at philbaker5@btinternet.com. Even though he is in the middle of the cross-country season, Liam Dunne wanted to test his 800m speed and lined up for the South of England Indoor Championships at Lee Valley at the weekend. Chichester’s older and younger athletes will be in action this weekend in different aspects of the sport. On Saturday, the Sussex Masters Cross Country Championships will be held at a different location at Coombes Farm, Lancing. While the course is not expected to have the sharp gradients of the previous Lancing Manor terrain nearby, the new venue will nevertheless present a real test of fitness for the six age groups of competitors, with all racing over a five-mile course, for the first time. The women’s categories are over-35, 45 and 55 with Chichester’s best chance likely to come in the over-55 group, where multiple masters medalists Jane Harrop and Helen Dean will be joined by Amanda Godfrey. 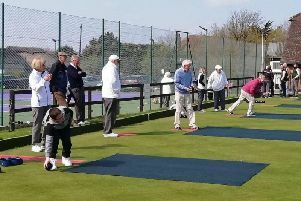 For the men, 42-year-old James Baker will spearhead Chichester’s challenge but such is the standard of veteran competition in Sussex at present that Chichester’s No1 will have to fight hard to finish on the top three in his age group, judging by the recent county seniors championships. On Sunday, Chichester’s juniors will be indoors at Tanbridge House School, Horsham, for the third match in the Sussex Sportshall League with Fleur Hollyer leading the girls’ team, fresh from her competitions at Lee Valley. All eyes will the club’s newest Sussex record holder, James Taylor, to see if he can improve on his record run in December.